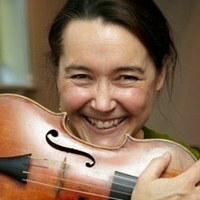 Maggie Faultless directs our next concert, Baroque Classics, in September. Early in her career she specialised in contemporary music, and was first violin the ensemble Aquarius for several years, was co-leader of the West End musical Chess, assistant leader of the Scottish Ballet Orchestra and freelanced with the City of Birmingham Symphony Orchestra and the Academy of St Martin’s in the Fields. However, a continuing interest in eighteenth-century performance practice led her towards exploring the possibilities of performance on historical instruments. She became a principal player in Roger Norrington’s London Classical Players, Andrew Parrot’s Taverner Consort, and The Academy of Ancient Music with Christopher Hogwood, and was a member of the period instrument Gainsborough String Quartet. Margaret is in demand as a lecturer on performance practice and her own particular research interests are distributed leadership in eighteenth-century repertoire and the performers’ relationship with notation. A graduate of Clare College, she is Director of Performance at the Faculty of Music, offering support and advice to all students interested in performance, and she is also Bye-Fellow of Girton College, and Musician in Residence at St John’s College. An Honorary Fellow of Birmingham Conservatoire and and both an Honorary Member of the Royal Academy of Music and Head of their Historical Performance Department, she became a Professor of the University of London in 2018 in recognition of her contributions to the profession, to education and research.